—George Bernard Shaw, The Quintessence of G.B.S. Learning is what we humans do best. We learn throughout our lives by wondering and exploring, experiencing and playing. This book is about harnessing that ineffable drive in learners—the drive to know, understand, and engage in the world and its ideas. The philosopher Cicero defined curiosity as a love of knowledge without the lure of profit (1914), in other words, an intrinsic passion to know. Aristotle (1947) claimed that the desire to know is among the deepest human urges, and Francis Crick, the Nobel Prize–winning scientist who discovered the structure of DNA, was often described as childlike in his curiosity (Pincock, 2004). Curiosity has been hailed as the major impetus behind cognitive development, education, and scientific discovery (Loewenstein, 1994). It is the drive that brings learners to knowledge. Curiosity is about being aware and open, checking things out, experimenting, and interacting within one's surroundings. In a classroom grounded in curiosity, teachers have the unique opportunity of being able to mine students' deepest held wonder, making their attention natural and effortless, and allowing them to fully engage. Creating the conditions for curiosity in the classroom will allow us to achieve more authentic motivation from both teachers and students, leading to deeper learning. It is no wonder that Curious George is one of the most beloved characters in children's literature. The little monkey who lives with the Man with the Yellow Hat wants to dig into each and every experience he comes across in order to explore and to experiment. And he often gets into trouble, especially because he is not limited by the things that are socially appropriate. He is free to do what he chooses, and is a monkey, after all, filled with all the monkeyshines we might expect. It is a good thing that Curious George has the Man with the Yellow Hat to save him from the tricky situations he gets himself into (to come by in a helicopter at just the right moment when George floats too high on a bunch of balloons, for instance). In the case of George, just as in the case of our students, playful curiosity plus scaffolding can transform into learning. We don't need to teach our students to be curious—like George, they are already curious. (Though they may not be curious about what we want them to be curious about.) Maybe at this moment they are wondering how the clay feels in a kindergarten classroom readying for a project or wondering how to talk to a friend they have a crush on in a middle school science lab. Are there learning moments that a skilled guide can find at the intersection between what the students are curious about and the topics at hand? Can we take our students' interest in skateboarding on a half-pipe and direct it into an interest in physics or engineering? Can we use their interest in persuading their parents to get a pet and mold it into skills in persuasive writing or speaking? In this book, I will make the case that students' curiosity coupled with teachers' own wonder and experience can guide students into deeper inquiry. Being curious is an essential part of human consciousness, a joyful feature of a life well lived. But as recent research evidence shows, fostering curiosity holds a power that goes beyond merely feeling good. In fact, curiosity may be critical to student success in school. What are the mechanisms by which curiosity compels learning? When students are curious, teaching and learning are never a chore. Whereas motivation that comes from the outside (via incentives and rewards) tends to be fragile and short-lived, motivation that comes from inside ourselves, from the wellspring of genuine curiosity, is much like a wild fire: It cannot be tamed, it will take sudden new turns or directions, and it will seek fuel in whatever way it can. In a classroom based on students' curiosity, teachers needn't ever worry about motivation. When children are allowed to follow their curiosity, they are more likely to stay on the path of exploration and insight. For example, a 1st grader's discovery of tadpoles in a marshy puddle in the play yard brings her immediate joy. That joy ignites the spark of curiosity, and she is then intrinsically motivated to further explore the puddle, since pleasure compels repetition. The girl may bring her classmates to see the puddle, or she may decide to look for tadpoles in other small ponds after school. In either case, she will seek to branch her experience outward. On each occasion that she returns to observe the tadpoles, she will pose questions and make hypotheses about them ("What do they eat?" or "How fast or far can they swim? "), with repeated observations guiding her mastery. The child will soon observe the tadpoles growing stubs of legs, and if she is allowed to continue to watch, she will witness the complex biological transformation of tadpoles becoming frogs. Her mastery of the topic, gained from experiential learning, will produce confidence. As this example illustrates, the movement into deep learning is fueled by curiosity and pleasure (Perry, 2001). Research shows that any student, given the opportunity to be genuinely curious, will respond in precisely the same way. In one study, groups of 5th and 6th graders learned about endangered wolves or coal mining in class. The first group participated in a group discussion on the facts they had learned, while the second group entered into a debate about the controversies surrounding wolves becoming endangered or the strip mining of coal. In this case, as in other studies, the "seductive details" of the controversy sparked curiosity. The second group not only showed more enthusiasm during the project, they spent significantly more time working on it and were more likely to give up a recess period to learn more about the topic (Lowry & Johnson, 1981). The increased time spent engaging with these topics inevitably led students to delve more deeply into them, which helped students understand the complex concepts better and remember the content later (see also Garner, Brown, Sanders, & Menke, 1992). The brain's desire and reward system (the producer of the neurotransmitter dopamine) is deeply embedded in our human development and evolution. Since social scientists believe that reward drives all behavior, and behavior creates evolutionary adaptation, the dopamine system has been critical in our evolution into the complex beings we are (Muller, 2014). When students are curious and seek to satisfy their goals and desires, they get a hit of this pleasure-producing chemical. In one study on the effects of dopamine, people were given a list of trivia questions, like "Who was the president of the United States when Uncle Sam first got a beard?" or "What does the term 'dinosaur' actually mean?" and then asked how curious they were to learn each answer. They then were given brain scans while being presented with both the answers to the trivia questions and additional unrelated information. When the participants' curiosity was triggered, their brains released dopamine. Upon being tested afterwards, participants were much more likely to remember information on the topics they were curious about. In addition, when participants were in a curious state, they were also more likely to remember the paired, unrelated information. In other words, when we are curious, our brains' surge in dopamine causes us to take in and remember the entire landscape of experience and information more deeply. This is because dopamine makes the hippocampus (the part of the brain associated with long-term memory) function better (Gruber, Gelman, & Ranganath, 2014). Such research lends support to what nature writer John Burroughs observed nearly a century ago: "Knowledge without love does not stick; but if love comes first, knowledge is pretty sure to follow" (1919, p. 28). Curious students learn more and learn better. Current research shows that people who nurture the tendency to seek new information and experiences show lasting brain effects. In one study, researchers identified a group of 3-year-olds who were extra curious and followed their development throughout their childhood and school experiences. At 11 years of age, these children were earning significantly higher grades than their peers. They were superior readers and had IQ scores that averaged 12 points higher than their less curious counterparts (Raine, Reynolds, Venables, & Mednick, 2002). In a related study at the other end of the lifespan, scientists discovered that older adults who were genetically predisposed to develop Alzheimer's disease, but who kept curiosity a daily part of their lives, warded off the disease for more than a decade. In particular, seeking out higher education, working in complex fields, playing music, avidly reading, and staying intellectually engaged created a recipe for keeping the brain effective and healthy (Vemuri et al., 2014). When we as teachers recognize that we are partners with our students in life's long and complex journey, when we begin to treat them with the dignity and respect they deserve for simply being, then we are on the road to becoming worthy teachers. It is just that simple—and just that difficult. Teachers play a critical role in helping students transform their curiosity into inquiry, by facilitating, focusing, challenging, and encouraging students in active engagement (Zion & Slezak, 2005). When a teacher guides students into new, related territory, expanding upon the interests of those students and branching them out, we call it scaffolding (Rogoff, 1990). Scaffolding supports those goals that the student can stretch to achieve with a bit of help but that he or she would be unable to reach alone (Vygotsky, 1934/1998). Again, supporting curious children is best achieved when teachers themselves are curious, when they are excited, involved, self-directed, and trying new things (Deci & Ryan, 1985; Engel, 2011; Ostroff, 2012). In that way, the curiosity classroom creates a culture of learning that emerges at the intersection of the students and the teacher. 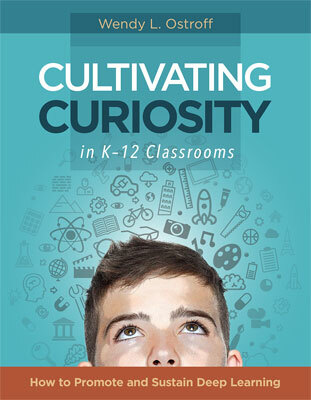 Curiosity is cultivated within classroom walls as a shared endeavor involving both students and teachers as learners. It is a collaborative search beginning with ideas and questions from the lived situations of all members (Greene, 1995). Fostering curiosity involves listening to the myriad of voices and perspectives of the class community members and respecting each other enough to put oneself "out there." Writer and teacher Parker Palmer (2003) has said that teaching is a daily exercise in vulnerability. Peers, too, take a risk by being present and prepared for the classroom setting based on curiosity. As one Brookline, Massachusetts, high school student put it, you don't just get what you put into it, you get what the entire class puts into it (Kohn, 1993). While my son still needs movement, still craves real-world learning, physical labor and ways to contribute to his family and his world, he's expected to spend most of his time in a desk, in a classroom, with 20-some other kids his age. He's not allowed to go outside at school when it's too cold or wet; he's expected to sit quietly in the library or auditorium during recess time. He's allowed few opportunities for "real" work; today, when you hand an 8-year-old a saw or allow him to start a fire, people look at you askance. One hundred and fifty years ago, my son would have been considered a model boy. Today, more often than not, he's considered a troublemaker. For students to be able to express curiosity, they must feel entitled to ask and to seek, even if that means going against the grain and straying a bit in their explorations. In fact, curiosity is highly malleable. As educators, each of us has the power to nurture or crush it in others. For our most at-risk students, time to wonder and wander is essential. Not surprisingly, these students (of whom society expects the least) have had their curiosity the most dulled by rote learning, high restrictions, and classrooms focused on obedience. The only hope for these at-risk kids—and all kids—is to reinstate curiosity in our schools, by disengaging the education system from standardization—both in curricula and assessment (Shonstrom, 2014). In order not to squash what comes naturally to students, we must allow for what philosopher Hannah Arendt called "the startling unexpectedness of all beginnings" (1961, p. 169), and what educational philosopher John Dewey (1916) called venturing into the unknown. The journey is equally as important for teachers as it is for students. Once we view ourselves as learners and explorers, more and more new things begin to seem possible (Greene, 1995). This represents a shift in the way we see the traditional role of a teacher, from one who asks and answers the questions, to one who elicits them. When science teacher Mark Knapp decided to do a unit on astronomy with his 6th graders, he knew almost nothing about astronomy, and told his class so. One kid exclaimed, "So now you're going to teach us something you know nothing about?" and Mark retorted, "You bet I am! Any homework that I assign you, I am going to do, myself. We're going to have a blast learning this together" (Fried, 2003, p. 111). Indeed, the curiosity classroom provides space for authentic and emergent experiences, possibility, and sense of ownership. This book is about empowering teachers to bring out and sustain curiosity in their students and to create a classroom in which it thrives. When the teacher is a co-learner, the knowledge and insight that the students bring to the classroom is just as important, and equally worthy to learn, as that of the teachers (Freire, 1998). This doesn't mean that teachers need to let children's every question and moment of tinkering derail the lesson plan. But they can plan significant portions of the curriculum around the goal of inviting and encouraging children to pursue their curiosity, helping children figure out just what it is they want to know, and then showing them how to systematically go about getting the answers to their investigations and explorations. One of the most valuable functions a teacher can serve is to help children become more aware of, and deliberate about, their curiosity. Teacher Melissa Parent uses the KWL approach—What do we know? What do we want to know? And what have we learned?—to build her curriculum. For example, for an upcoming science unit on sound, she let her students know, "We need to study sound, but you get to decide what we learn about." This allowed her to focus her lesson prep on the aspects of sound that the class was genuinely interested in. She told them, "You are the designer of this unit" and reminded them that she's new to teaching and has a lot to learn herself. They knew immediately that she would not just be teaching things to them—that they would be learning things together (Fried, 2003, p. 119). As teacher Carolyn Edwards points out, teaching as a co-learner is not about making things smooth or easy for the students. Quite the contrary. Teacher facilitators stimulate learning by making problems more complex, involved, and stimulating (Edwards, 1993). Helping students to follow their own interests and guide them in inquiry takes patience and hard work. "I'm in control of putting students in control," is how one educator put it—a responsibility that is much more complex than simply telling students what to do (Kohn, 1993). The "We" Rather Than the "I"
Co-creating a curiosity classroom requires some degree of humility. Teachers have to cease being in charge and listen to the multitude of voices in the classroom with equal respect. One of the greatest novelists of all time, Leo Tolstoy, did something akin to this when he opened free schools—without programs, punishments, or rules—for local peasant children. In his piece "Who Should Learn Writing of Whom: Peasant Children of Us, or We from Peasant Children?" Tolstoy (1862/2015) described the barely literate children he worked with from the streets, whose self-awareness in writing and complexity in ideas rivaled his own. Learning from them was first strange and humiliating, but ultimately liberating, as Tolstoy and the children began to cowrite their stories. "Someone said, let's make this old man a wizard; someone else said, no, we don't need to do that, let him be just a soldier; no better have him rob them; no, that wouldn't fit the proverb" (p. 302). As soon as Tolstoy put his ego aside and stopped trying to instruct them, all children participated in writing the story. They became carried away with the process of creation itself, and this was the first step in the direction of inspiration. The children composed plotlines, created the characters, described their appearances in great detail, and invented individual episodes, all in clear linguistic form. The work was a true collaborative effort, in which the children felt themselves to be equal partners with an adult. Children spent sun up to sun down at their studies, and at the end of the day, they were still reluctant to leave the schoolhouse (Ashton-Warner, 2003). Tolstoy concluded that authentic education involves awakening in the child what already exists within him, and simply helping him to develop it (Vygotsky, 1967/2004). When planning lessons, we must consider both our own objectives and goals and those of the students. Says one high school teacher, "Spending time on student generated interests is always much more gratifying and effective teaching in my opinion. Years later, it is often those moments that students have told me are the most memorable for them." When implementing lesson plans, we need to consider the learning goals that the students will have for themselves, as well as those we will have for them. Both sets of goals can be built upon the students' previous learning experiences. During assessment, documentation, and evaluation we can gather evidence of the effectiveness of the curriculum by identifying what was learned from both the teacher and student perspective (Wood & Attfield, 2005). All students—indeed, all humans—are curious. Supporting and scaffolding curiosity opens learners up to knowledge. Students' and teachers' curiosity can be combined to co-create a curiosity classroom. Creating a curiosity classroom shifts the traditional views of teaching and learning. If the goal of school is innovation, creativity, and authentic progress, curiosity is a blessing. Curious children (i.e., all children) take risks, are intellectually playful, try things out, make productive mistakes, and learn deeply (Leslie, 2014). It takes just a few minor adjustments to transform any classroom into a hotbed of curiosity, beginning with a shift in how teachers view themselves, from teachers to teacher-learners who are curious in their own right about the processes of facilitating learning. In a way, doing this means setting up the classroom to support those skills that all learners begin with, such as the drive to explore, effortless learning, imagination, and intrinsic motivation. Finally, teachers must arrange the time, space, and orientation of the lessons in such a way for these inherent skills to bloom. Children are superb learners. Each and every student is part of an evolutionary and developmental trajectory of learning that is structured into their biology and cultural context. When provided with the freedom and scaffolding to pursue their own interests, they can and will become efficient, joyful super-learners (Gray, 2013). In what ways are children inherently curious, and how can we support and extend that curiosity? Small movements in perspective can transform the classroom into a container for an exciting new mode of learning together to happen. When students retain inherent curiosity and wonder, they will first go about asking questions, then seek ways of knowing and approach answers, and finally, begin again with more questions. When students adopt these habits of mind, they are unable to be stopped from learning throughout their lives. Teachers suddenly find themselves being surprised again, asking questions again, remembering what it was that they were so curious about once upon a time, and having a lot of fun. In the meantime, they begin creating a space where the most essential skills for deep learning are germinated—the curiosity classroom.